In 1999, two independent directors,Daniel Myrick, and Eduardo Sánchez ,with a sub million dollar budget released their film, The Blair Witch Project. The film was released to various praise and anticipation. Under normal circumstances, this film would have probably not been successful, but the two directors made a great decision to employ methods of transmedia storytelling. According to Henry Jenkins, transmedia storytelling is, “a process where integral elements of a fiction get dispersed systematically across multiple delivery channels for the purpose of creating a unified and coordinated entertainment experience”. The directors of this film mastered this idea and also took advantage of the rising trend of the internet. Photo seen on the website. 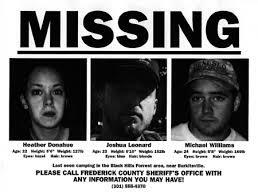 A missing person poster of the three filmmakers. The film is a found footage film that documents to travels of three filmmakers on a quest to find the fabled blair witch. Some time before the film’s release, a website was launched called www.blairwitch.com. This website contained mythology of the supposed blair witch, photos of the characters in the film and even police reports about their disappearance. Everything that someone would want to know about this story was on the website. What makes this work as transmedia storytelling is the use of negative capability, which is a narrative evoking mystery or doubt. The mystery comes from the fake police reports and bios of the characters, leading the viewer to believe that the occurrences of the film were real. The website brings a fictional story to life in our world and also adds back story to it. The way the filmmakers are explained, it could be anyone, which is what makes it so realistic. Henry Jenkins also says that “transmedia stories are based not on individual characters or specific plots but rather complex fictional worlds which can sustain multiple interrelated characters and their stories”. This is Blair Witch in a nutshell, but the fictional world the directors created is heavily based and can be seen as the world we are all living in today. Janet H. Murray writes that “when the writer expands the story to include multiple possibilities the reader assumes a more active role”. The readers and viewers of this film take many different roles but not in a voluntary way. If a viewer went to the website before watching the film, he/she went in with some slight insight and engulfed him/herself in the world of Blair Witch, more or less believing that is was true. Many discussion boards and blog posts are still arguing today whether Blair Witch was real or not. Whether it be true or not, these elemtns of transmedia storytelling allow this film to gross far more than its budget and is the main reason the film is still relevant today. I choose the Avenged Sevenfold page because I have visited it frequently over the years and I am well versed in the history of the group. Sevenfold debuted with “Sounding the Seventh Trumpet” on Good Life records in 1999, then achieving a good amount of American fame in 2003 with the release of their sophomore album, “Waking the Fallen”. 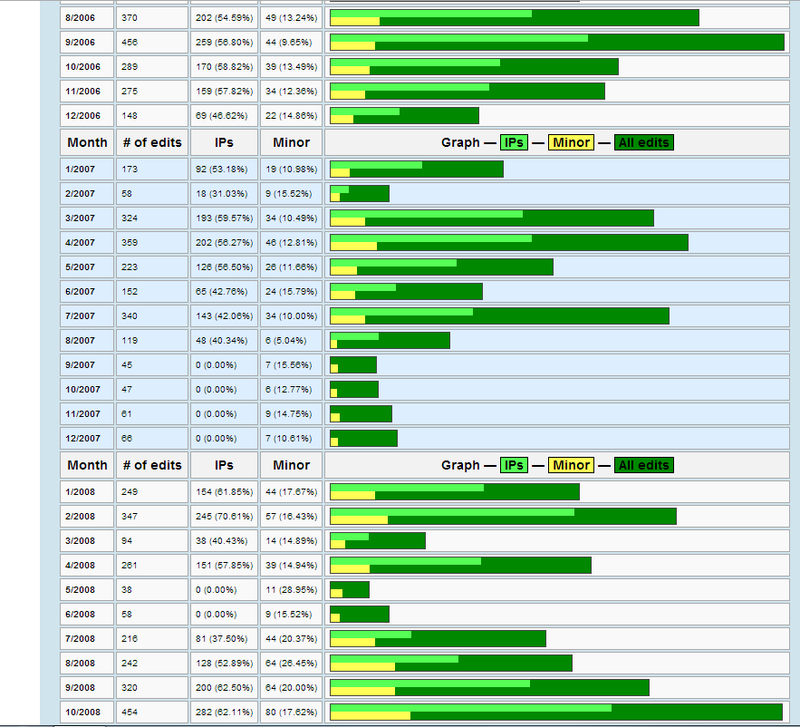 What I find interesting is that the page was not founded until 2004, but only had 11 edits in that year. The take-off in edits occurred in 2006, most likely because their 2005 release, “City of Evil”had multiple singles on radio and MTV circulating and the band playing an important slot on “Ozzfest”. The album eventually was certified as a gold record by the RIAA. The next big jump in edits was in 2008, when their eponymous album was receiving incredible publicity and awards around the music scene.. From 2006 to 2008, the edits stayed in high figures, never getting below 1900. What I found strange was one of the lowest points of edits was in late 2009 and early 2010, around the time when drummer, James Sullivan, died. The edits for this most likely took place in February of 2010,, which is when the cause of death was discovered. Edits for this page have been on the decline for the most part since 2008. This page early on seemed to be an example of a base for collective intelligence, but as time went on, less and less people seem to be contributing. According to Henry Jenkins, collective intelligence is, “The ability to pool knowledge and compare notes with others towards a common goal”. It seems that the pool of people giving to this has page diminished over time and now, doesn’t seem to be working as much as a collection of intelligence but just a retelling of intelligence. The group has just recently released a new album, “Hail to the King” which is currently getting high praise and radio airplay, but the edits remain stagnant. The question becomes, “Does the page have to have a high edit count to be considered collective intelligence?”. People could just be getting the information right the first time, which would make this a collective intelligence page. A reason for this rebuttal is that according to the traffic statistics, the page has been visited 1,139,972 times in the last 30 days, more the 3,200 day. Even though the edits are on the decline, the sharing of intelligence is not. This is a collective intelligence because people are coming to this page frequently to receive information about the topic. This also proves another one of Jenkins’ points, that, “The Wikipedians sought to make the production of knowledge more transparent to everyday people”. With that many people visiting the page everyday, it seems people are just going to collect new intelligence and more likely than not, nothing else. Transparency as a new media literacy means not being able to see how media shapes the world. This page has less contributors to the pool of knowledge but an amazing amount are drinking from this pool and that to me means it is a collective intelligence. 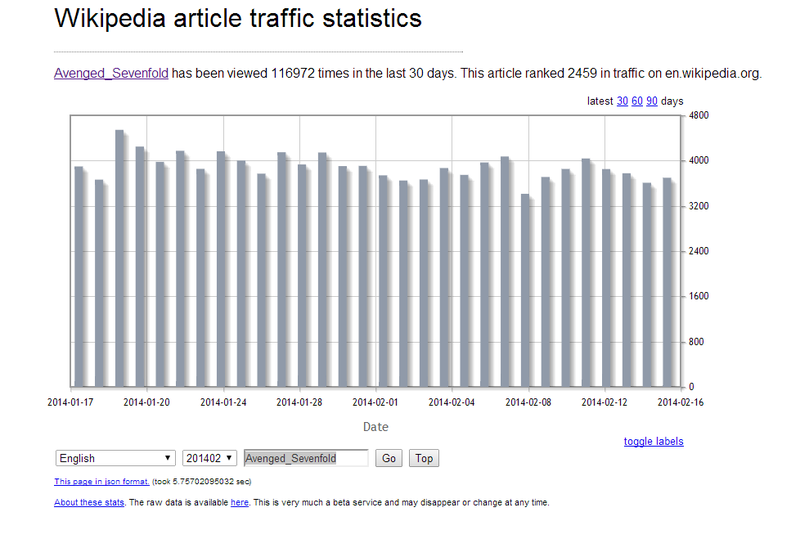 “WHAT WIKIPEDIA CAN TEACH US ABOUT THE NEW MEDIA LITERACIES (PART ONE).” Web log post. Confessions of an AcaFan. Henryjenkins.org, 26 June 200. Web. 14 Feb. 2014.